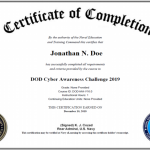 Cyber Awareness Challenge is developed by the Defense Information Systems Agency for the DoD Chief Information Officer. Content is based on input from the Workforce Improvement Program Advisory Council. DoD and other agencies use this course to satisfy mandatory training. 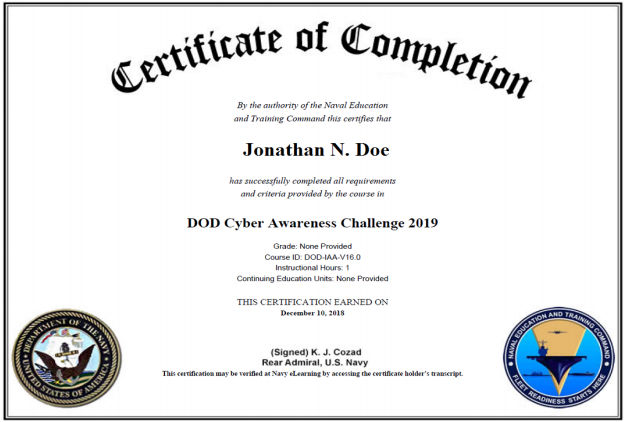 It addresses DoD 8570.01M Information Assurance Workforce Improvement Program (WIP), 10 November 2015, incorporating Change 4; Office of Management and Budget Circular NO. A-130; and the Federal Information Security Modernization Act (FISMA) 2014. This version offers a completely new look and feel. It starts with a message from the future describing serious vulnerabilities resulting from decisions in the present. The learner is asked to help prevent these incidents by making proper cybersecurity decisions about events from the evidence provided. Through this process, the user learns proper cybersecurity practices. Users will be given the opportunity to answer questions to determine whether they need the Intelligence Community (IC) lessons and if they want to take the knowledge check track. The knowledge check option allows users to answer random questions before each lesson, based on content from the 2018 version. If all questions are answered correctly, that lesson can be bypassed and the user will be allowed to move to the next lesson. There is also a Facilitator Guide and Briefing designed for group presentations where taking the online course is not feasible due to technical constraints.